123Pet Software is a business management software designed specifically for pet grooming salons, pet daycare facilities, and mobile pet groomers. 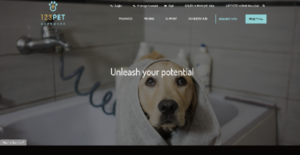 It equips businesses with unique tools and capabilities to help them manage and grow their pet grooming and daycare business. It comes with a plethora of features designed to streamline essential business processes, including booking management, text reminders, payment facilities, payroll, and marketing to mention a few. 123Pet Software centralizes all business tasks, allowing users to perform all their processes, manage their clients, meet their needs, and grow their business using a singular, unified solution. On top of that, 123Pet Software is optimized for mobile implementation. This capability is crucial for professional pet groomers that offer on-site services to their clients. 123Pet Software comes with appointment scheduling tools that help clients pick the best time for their appointment or onsite service. This is coupled with an appointment reminder functionality that notifies clients of their upcoming appointments through email or text to reduce the number of no-shows and increase revenue significantly. You can embed a ‘Book Now’ button on your Facebook or Instagram accounts so your prospects can book your services without having to exit your social media pages. You can also cater to your clients’ unique pet requirements and provide them with special services if they have any special need, such as pet pick-up or unique grooming preferences. 123Pet Software offers integrated credit card processing. This capability speeds up and simplifies the checkout process. It eliminates having to switch between different systems to process your clients’ payments. Hence, you can offer your customers faster checkouts and lower rates. Additionally, all reports are consolidated. You don’t have to reconcile bank statements with your closed tickets to check if they match and if all the services you rendered have been paid. 123Pet Software lets you create custom, pre-made, and one-time email marketing campaigns and let the whole workflow go on auto-pilot. You can evaluate the performance of your campaigns and identify what works and what doesn’t. This way, you can make the necessary changes and only run the most effective marketing campaigns on all cylinders with little human intervention. If you are considering 123Pet Software it might also be beneficial to analyze other subcategories of Best Appointment Scheduling Software collected in our database of B2B software reviews. It's essential to keep in mind that hardly any service in the Appointment Scheduling Software category will be a perfect solution that can match all the requirements of various business types, sizes and industries. It may be a good idea to read a few 123Pet Software reviews first as specific services might excel exclusively in a very narrow set of applications or be designed with a very specific type of industry in mind. Others might function with an idea of being easy and intuitive and therefore lack complicated elements desired by more experienced users. You can also find software that cater to a wide group of customers and provide a powerful feature set, but that in most cases comes at a more significant cost of such a service. Make sure you're aware of your requirements so that you select a software that offers all the functionalities you look for. How Much Does 123Pet Software Cost? We realize that when you make a decision to buy Business Process Management Software it’s important not only to see how experts evaluate it in their reviews, but also to find out if the real people and companies that buy it are actually satisfied with the product. That’s why we’ve created our behavior-based Customer Satisfaction Algorithm™ that gathers customer reviews, comments and 123Pet Software reviews across a wide range of social media sites. The data is then presented in an easy to digest form showing how many people had positive and negative experience with 123Pet Software. With that information at hand you should be equipped to make an informed buying decision that you won’t regret. What are 123Pet Software pricing details? What integrations are available for 123Pet Software?